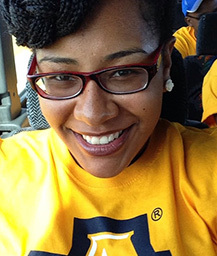 Our Team Gabrielle Stuart — Young Ladies 4 CHRIST, Inc.
North Carolina A&T State University. "I will praise thee; for I AM FEARFULLY and WONDERFULLY made: marvelous are thy works; and that my soul knoweth right well." The sleepover! This was my first time meeting the girls and there was an amazing time that was had. I got to know the girls and they got to know me. This "field trip" was the foundation of the bond I'm building with these young ladies and I am eternally grateful. "I am new to the Leadership Team, but I am certainly not new to YL4C Inc. Young Ladies 4 Christ Inc. cultivated in me at the tender age of 6 what it meant to be a young lady and how to be a woman after God's own heart. Today, I have the esteemed honor of being the "cultivator" that someone was for me, a role model and mentor. This passage into womanhood is not a very easy one. So this need for postive influences, healthy relationships and solid God based foundation is sought after now more than ever. Young Ladies 4 Christ Inc. provides those exact necessities. At YL4C Inc. you are provided the opportunity to do nothing but great things because we foster the mindset for these young ladies to do nothing but grow. I thank The Lord everyday for his unmerited favor and mercy, to have the participation of these young ladies and the commitment of the Leadership Team. To God be the Glory!"